Atlantic Fleet Weapons Training Facility [AFWTF] on Vieques Island officially closed on April 30, 2003. On that date, the Department of the Navy has transferred all real property on the eastern end of the island of Vieques, Puerto Rico to the administrative jurisdiction of the Department of Interior as required under the Floyd D. Spence National Defense Authorization Act for Fiscal Year 2001 (Public Law 106-398), as amended by Section 1049 of the National Defense Authorization Act for Fiscal Year 2002 (Public Law 107-107). The Atlantic Fleet Weapons Training Facility (AFWTF) was a shore activity at Naval Station Roosevelt Roads, Puerto Rico. It served as the Navy's premier training range for ensuring combat readiness of Atlantic Fleet Forces. AFWTF's ranges allowed the simultaneous conduct of gunnery, missile firings, air-to ground ordnance delivery, electronic warfare, and underwater operations, all coordinated with scoring and recording. AFWTF was a multiple warfare support activity that served as the Navy's major training ground for ensuring the combat readiness of the Atlantic Forces. It consists of four separate ranges (Outer Range, Inner Range, Underwater Tracking Range, and the Electronic Warfare Range) specially equipped with targetry, instrumentation, sensors, communications, and related facilities. 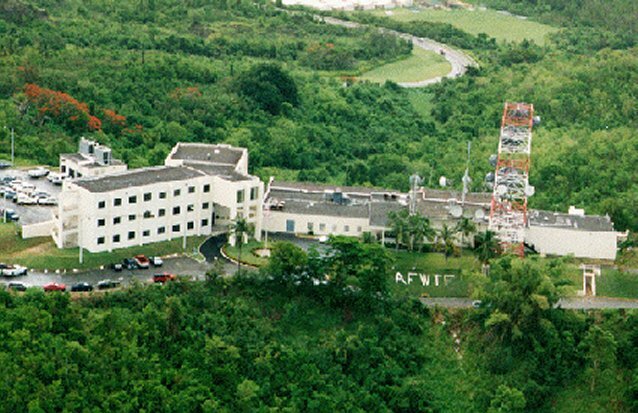 AFWTF facilities are located at numerous sites throughout the Caribbean on the islands of St.Croix, St. Thomas, Vieques, and Puerto Rico. The moderate tropical climate is ideal for training exercises. Cancellations due to inclement weather are very rare. AFWTF encompasses all facilities necesary for target development, repair, and utilization. These facilities are located on Naval Station Roosevelt Roads and Pico del Este in Puerto Rico, Crown Mountain in St.Thomas, Sprat Hall and St.George Hill in St.Croix, and Mount Pirata and Cerro Matias in Vieques. The Aerial Target Shop Assembles all the drone targets used at AFWTF. AFWTF uses subsonic BQM-34S, BQM-74E, and supersonic AQM-37C aerial targets. The Drone Launch Facility is located at Cabras Island on the Naval Station. Once the target is launched, The Naval Warfare Assessment Center, Corona (NWACC) field office provides missile telemetry collection and analysis services to evaluate the missile's performance. The Torpedo and MK-30 Shops support the Underwater Tracking Range by providing torpedoes and MK-30 mobile ASW targets for scheduled exercises. The Torpedo Shop has the capability to assemble MK-46 REXTORPS, and prepare MK-48 torpedoes for shipment. The MK-30 Shop assembles and programs al MK-30 targets used on the range. Marine Ocean Engineering (MOE) supports all the ranges with five vessels equipped to handle a variety of missions. MOE also operates and maintains a variety of surface targets for gunnery exercises. On 24 May 2000 ITT Industries, Systems Division, Colorado Springs, Colo., was awarded a $2,715,416 firm fixed price contract to provide management and technical services for the operation and maintenance of the Atlantic Fleet Weapons Training Facility (AFWTF) at US Naval Station, Roosevelt Roads, PR. This contract contains six one-year options, which, if exercised, will bring the total cumulative value of the contract to $65,959,419. Work will be performed at the U.S. Naval Station, Roosevelt Roads, Puerto Rico (60%), Pico del Este, Caribbean National Forest, Naguabo, P.R. (10%), St. Croix, U.S.V.I. (15%), St. Thomas, U.S.V.I. (5%), and Viegues Island, P.R. (10%). The work commenced July 2000 and was expected to be completed by September 2000. The Inner Range is a multi-purpose target complex located on the eastern portion of Vieques Island encompassing 10,800 acres and the surrounding airspace and waters. It consists of the eastern training area, amphibious beaches, small arms ranges, a live impact area, and practice minefields. The complex can support air-to-ground, mine delivery, naval gunfire, artillery exercise, and subsurface assaults. Real time critique data is available for all exercises and a visual scoring system is capable of measuring bomb drops within 1 foot. The complex allows a full amphibious assault to be conducted in the most realistic training environment in the world. The Outer Range encompasses two ocean operating areas, the North and South Ranges, which are used for various types of live ordnance exercises and other events requiring large areas of air/sea space. A vast array of integrated instrumentation is employed on the range to allow for tactically realistic target presentations and real time display of range evolutions. Typical exercises include surface-to-air, air-to-air, air-to-surface, and surface-to-surface missile firings as well as various gunnery exercises. Various range data products are available for accurate post-exercise reconstruction and analysis. This rare combination of large areas of air/sea space coupled with sophisticated range instrumentation allows for the unique ability to train US and foreing militaries in realistic multi-warfare environments. The Underwater Tracking Range Facility, located on the west coast of St.Croix, provides the capability to conduct a variety of anti-submarine warfare exercises along with research/development and independent ship qualifications. Services available include torpedo firing exercises, Surface Ship Radiated Noise Measurement trials, submarine Training Readiness Evaluations, and any operation for which precise, in-water spatial data is required. AFWTF provides exercise torpedoes, MK-30 targets, tracking instrumentation, and rapid post-analysis data products which can be custom made for the individual unit. Four hundred square nautical miles of instrumented acoustic tracking range allow multi-ship and submarine battle group training. The Electronic Warfare Range is the fourth and most recent range added to AFWTF. Radar threat platform simulators are located on Vieques, St.Croix, and Pico del Este. These sites can provide services to portions of the north and south warning areas and the Inner Range. The range can provide multi-axis, real world scenarios designed to simulate the electronic order of battle for specific geographical regions requested by the unit. A scenario is developed to emulate the possible threat signals which might be encountered according to intelligence reports. The signals range from navigational radars to missile associated radars.